White Canary has been the name of both a hero and villain in DC Comics, appearing as an opponent of Black Canary in the comic Birds of Prey and as her superhero sister, Sara Lance, in The CW television series Arrow. In spin-off series Legends of Tomorrow, she joins a team of superheroes gathered to fight the futuristic villain Vandal Savage. 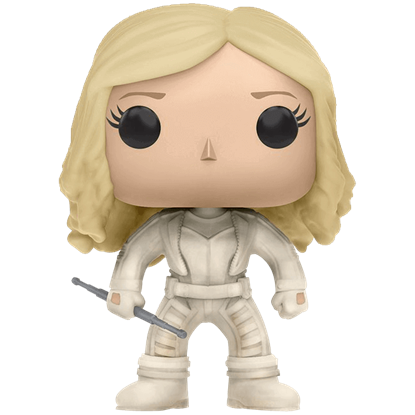 Superheroes Direct offers White Canary collectibles and apparel based on her different incarnations, including licensed White Canary POP Figures where she appears in her all white Arrowverse outfit. Shop here for White Canary t-shirts, White Canary gifts, DC Comics White Canary merchandise, and Sara Lance collectibles sure to please any fan of this skilled martial artist and trained assassin. Former assassin and Team Arrow member, Sara Lance, joins forces with Time Master, Rip Hunter, in the CW series, DC Legends of Tomorrow. The DC Legends of Tomorrow White Canary POP Figure presents a trendy version of the superhero.